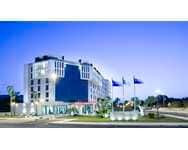 The Hilton Garden Inn Houston/Clear Lake NASA hotel in Texas is conveniently located just off I-45 Bay Area Blvd. at Exit 26, in the heart of Webster, Texas. Webster is strategically positioned midway between downtown Houston and Galveston with Interstate 45, Bay Area Boulevard, and NASA Parkway as its central corridors. Stationed next door to NASA’s Johnson Space Center, Webster is the perfect location to live, work, dine, play, stay and shop. 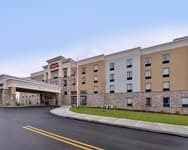 Our Hilton Garden Inn Houston/Clear Lake NASA hotel is 20 minutes from Houston, 25 minutes from Galveston and 45 minutes south of George Bush International Airport (IAH) and 12 minutes south of Hobby Airport (HOU). 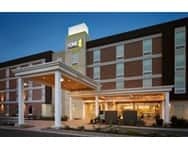 The Hilton Garden Inn Houston/Clear Lake NASA hotel in Texas is situated near many corporate offices; our focus-service hotel is known for its southern hospitality and friendly service. Enjoy a relaxing family vacation or wild weekend getaway to Houston, Clear Lake in Webster, Texas – the South’s family-friendly vacation spot. With so many exciting family attractions, activities and theme parks in the Houston Texas Area, you are sure to have a vacation full of lasting memories. While staying at the Hilton Garden Inn Houston/Clear Lake NASA hotel in Texas enjoy a soaring good time at NASA Johnson Space Center Houston, where people can experience space from its dramatic history and exciting present to its compelling future. Spend the afternoon exploring Houston Zoo. Plan a fishing excursion on Galveston Island. Enjoy Kemah Board Walk where the fun never stops or try the new 3,256 foot long roller coaster. Take the kids to the Houston Museum of Natural Science, the exhibit halls are host to a rich and diverse collection of natural treasures and technological marvels, and then catch a Houston Astros baseball game at Minute Maid Park. 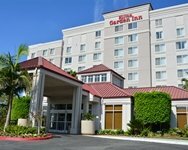 Your family vacation begins at the Hilton Garden Inn Houston/Clear Lake NASA, where you will enjoy beautiful hotel accommodations, complimentary internet, HDTV, movies and video games. Make a splash in our outdoor pool and enjoy a soothing soak in our hot tub. Start your day with our cooked-to-order breakfast from the Great American Grill and then go and have more fun in the exciting city of Houston, Texas. Our well appointed guest rooms at the Hilton Garden Inn Houston/Clear Lake NASA features modern convenience catering to the savvy traveler, along with a great location and recreational amenities to please our leisure hotel guests. Spacious guest rooms, generous work area, our signature Sleep System bedding and complimentary high-speed internet in our guest rooms and public areas – both wired and wireless for your convenience. Here are a few of the amenities at the Hilton Garden Inn Houston/Clear Lake NASA hotel in Texas: * Outdoor swimming pool * Well-equipped fitness center * Room Service * Wireless HSI Relax in our Lobby Lounge or dine at our casual Great American Grill hotel restaurant offering breakfast and dinner daily.